Traditional companies are discovering value in adopting a transformative approach to workplace design. The Cleveland office of law firm Zashin & Rich. Image courtesy of Vocon. For years we’ve seen the technology industry and coworking entities shape the design of the workplace. Today, professional services firms — law, finance, tax, and accounting — are also transforming their workplaces and organizational cultures to operate more like their progressive counterparts. These traditional companies are finding value in adopting a transformative approach to office design. Law firms, in particular, are adapting the design of their spaces to adjust to new trends in the profession. With the dynamic mix of generations in the workforce and the advent of new technologies, the way people work has drastically changed. Law firms now require a space that allows for both balanced teamwork and focused work and also provides the opportunity for continuous learning. To enable a law firm and its employees to thrive, partners need to reevaluate their space and transform the built environment. There are several key trends currently impacting the legal profession. When used to inform a space’s design, they help to improve a firm’s performance and enable organizations to attract, excite, and retain exceptional people. Evolving technologies coupled with new economic realities have led law firms to re-imagine the type and quality of space they need. Changing client perceptions about legal services has encouraged law firms to take a critical eye to their real estate needs, often times reducing their rentable space while maintaining attorney counts. The need to host clients in a luxurious office has been replaced with a clean, modern aesthetic that communicates success in a smart, savvy manner. Using space efficiently will become increasingly important to maximize company assets while offering flexible environments that meet the needs of permanent office inhabitants and mobile workers alike. With new technologies come changes in where and how employees work. Remote collaboration and online sharing of resources and services is now commonplace. Offering the right workspace today is critical to attracting and retaining talent, as the new “knowledge worker” is not impacted by location. Employees desire a mobile environment to fulfill their functions in a space that supports their need for flexibility. New technological developments make mobility possible, thanks to tools like virtual law libraries, laptops, and smartphones. Making sure these items are provided as primary tools to employees has become critical for fulfilling their needs — and ensuring they stay productive. The most forward-thinking law firms offer work setting choices — an optimal mix of space that includes areas for focused work as well as collaborative settings for socialization. Today’s work environments support smaller communities and smaller work groups, as well as alternative workspaces such as benching, mobile and community zones, hoteling, and free address options. Offering these types of spaces also allow for the office to become a true private space, enabling focus work without distraction. Technology affords attorneys the ability to work anywhere at any time, leading to on-demand collaboration between employees. Creating casual areas that support impromptu encounters, space for smaller work groups and virtual work is critical. The strategy and design behind collaboration areas is important for any successful business. Law firms are considering the overall experience of their workspace for both clients and employees. When well-positioned in the physical space, a firm’s identity has a positive impact on client impressions, talent attraction and retention, and employee experiences. The firm’s brand touches each of these stakeholders and can be a powerful tool to reinforce organizational philosophies — business, culture, social, and environmental. The experience of each user — customer and employee — is optimized by tightly integrating a firm’s identity and experience into the workplace design. Today’s progressive law firms are embracing transparency in a big way to support a more open and inclusive work environment, and also to reinforce the firm’s culture and organizational structure. Elements like glass-fronted offices and conference rooms encourage natural light to seep into dark workspaces, plus help to remove barriers to knowledge share, mentoring of associates and broader communication of firm goals, fostering new opportunities and insight. It’s important to understand how a law firm functions so the design of its spaces can be utilized to support its distinctive needs. 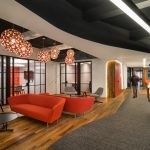 Workplaces should be agile to allow for the integration of new design trends as well as adapt to the ever-changing demands and requirements of the company and its employees. Simply put, implementing the right design trends into a law office can create an organizational advantage. From the editor: For more on the evolution of law office design, check out the recap of our September 2016 Work Design TALK we held on the topic.